The ISM43340-L77 quad-radio device provides the highest level of integration for wireless system, with integrated dual band (2.4 GHz/ 5 GHz) IEEE 802.11 a/b/g/n single-stream, MAC/baseband/radio, Bluetooth 4.0. The ISM43340 includes integrated power amplifiers, LNAs and T/R switches for the 2.4 GHz and 5 GHz WLAN bands, greatly reducing the external part count, PCB footprint, and cost of the solution. 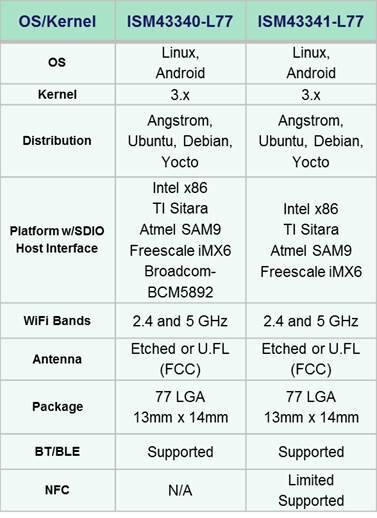 This product is intended for embedded Linux/ Android applications running on qualified Host processors with a SDIO interface. This product is targeted at high volume designs with experienced Linux / Android customers. A Software License Agreement is required for Driver support.